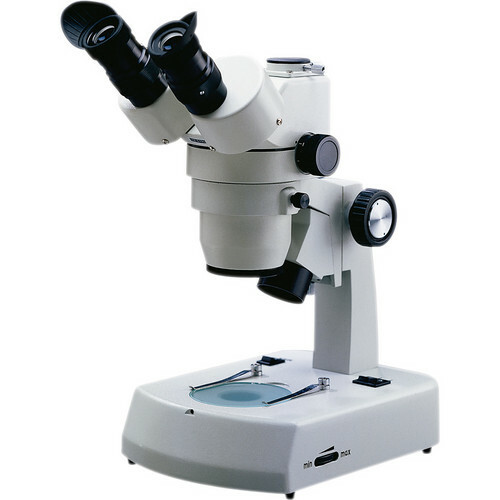 The 420T-430AHF-15 1-4x Stereo Zoom Microscope with Trinocular Port from National Optical is a stereoscopic zoom microscope designed for laboratories and university students. The stereo (two) eyepiece configuration is preferred by most researchers and students because of the superior depth of field and comfort compared to monocular microscopes. The 420T-430AHF stereo microscope has a paired 15x eyepiece delivering a 15x to 60x continuous magnification range. The achromatic objective lens system is parfocalled and parcentered throughout the zoom range to keep the specimen in focus and centered while zooming in/out. A trinocular port enables the 420T series to transmit its magnified image to an SLR or video camera attached to the port using an included C-mount adapter. When not in use for capturing images, the trinocular port can be secured using a metal thumbscrew. Optional eyepieces and auxiliary objectives expand the microscope’s magnification range and working distance, further broadening the functionality of the optical system. The 420T-430AHF can illuminate the specimen from above using a 15W halogen light and/or from below the stage using a 5W fluorescent light; each light source is activated separately by base-mounted On/Off switches. To help optimize the brightness and contrast of the specimen, the top (incidental) light beam is intensity and direction adjustable. A user-friendly design complements the range of features that make the 420T-430AHF stereo zoom microscope a welcome addition to labs and classrooms. This configuration of the 420T series microscope includes a cast metal fixed arm stand that will accommodate specimen heights up to 45mm. The viewing head is also capable of 360° rotation to help share the stereo eyepiece among colleagues and students without moving the microscope. An adjustable interpupillary distance, individually adjustable diopter correction, and reticle holder/retainer provide this 420T series microscope with the flexibility needed to create a customized viewing experience.